Electricity is the set of physical phenomena associated with the presence of electric charge. Although initially considered a phenomenon separate from magnetism, since the development of Maxwell's Equations, both are recognized as part of a single phenomenon: electromagnetism. Various common phenomena are related to electricity, including lightning, static electricity, electric heating, electric discharges and many others. In addition, electricity is at the heart of many modern technologies. The presence of an electric charge, which can be either positive or negative, produces an electric field. On the other hand, the movement of electric charges, which is known as electric current, produces a magnetic field. When a charge is placed in a location with non-zero electric field, a force will act on it. The magnitude of this force is given by Coulomb's Law. Thus, if that charge were to move, the electric field would be doing work on the electric charge. Thus we can speak of electric potential at a certain point in space, which is equal to the work done by an external agent in carrying a unit of positive charge from an arbitrarily chosen reference point to that point without any acceleration and is typically measured in volts. In electrical engineering, electricity is used for: electric power where electric current is used to energise equipment; electronics which deals with electrical circuits that involve active electrical components such as vacuum tubes, transistors, diodes and integrated circuits, and associated passive interconnection technologies. Electrical phenomena have been studied since antiquity, though progress in theoretical understanding remained slow until the seventeenth and eighteenth centuries. Even then, practical applications for electricity were few, and it would not be until the late nineteenth century that engineers were able to put it to industrial and residential use. The rapid expansion in electrical technology at this time transformed industry and society. Electricity's extraordinary versatility means it can be put to an almost limitless set of applications which include transport, heating, lighting, communications, and computation. Electrical power is now the backbone of modern industrial society. "Electric" redirects here. For other uses, see Electric (disambiguation) and Electricity (disambiguation). Electricity is the set of physical phenomena associated with the presence of electric charge. Although initially considered a phenomenon separate from magnetism, since the development of Maxwell's Equations, both are recognized as part of a single phenomenon: electromagnetism. 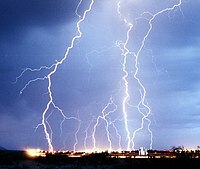 Various common phenomena are related to electricity, including lightning, static electricity, electric heating, electric discharges and many others. In addition, electricity is at the heart of many modern technologies. The presence of an electric charge, which can be either positive or negative, produces an electric field. On the other hand, the movement of electric charges, which is known as electric current, produces a magnetic field. When a charge is placed in a location with non-zero electric field, a force will act on it. The magnitude of this force is given by Coulomb's Law. Thus, if that charge were to move, the electric field would be doing work on the electric charge. Thus we can speak of electric potential at a certain point in space, which is equal to the work done by an external agent in carrying a unit of positive charge from an arbitrarily chosen reference point to that point without any acceleration and is typically measured in volts. Electrical phenomena have been studied since antiquity, though progress in theoretical understanding remained slow until the seventeenth and eighteenth centuries. Even then, practical applications for electricity were few, and it would not be until the late nineteenth century that engineers were able to put it to industrial and residential use. The rapid expansion in electrical technology at this time transformed industry and society. Electricity's extraordinary versatility means it can be put to an almost limitless set of applications which include transport, heating, lighting, communications, and computation. Electrical power is now the backbone of modern industrial society. In 1887, Heinrich Hertz:843–844 discovered that electrodes illuminated with ultraviolet light create electric sparks more easily. In 1905, Albert Einstein published a paper that explained experimental data from the photoelectric effect as being the result of light energy being carried in discrete quantized packets, energising electrons. This discovery led to the quantum revolution. Einstein was awarded the Nobel Prize in Physics in 1921 for "his discovery of the law of the photoelectric effect". The photoelectric effect is also employed in photocells such as can be found in solar panels and this is frequently used to make electricity commercially. Study has shown that the origin of charge is from certain types of subatomic particles which have the property of electric charge. Electric charge gives rise to and interacts with the electromagnetic force, one of the four fundamental forces of nature. The most familiar carriers of electrical charge are the electron and proton. Experiment has shown charge to be a conserved quantity, that is, the net charge within an isolated system will always remain constant regardless of any changes taking place within that system. Within the system, charge may be transferred between bodies, either by direct contact, or by passing along a conducting material, such as a wire. :2–5 The informal term static electricity refers to the net presence (or 'imbalance') of charge on a body, usually caused when dissimilar materials are rubbed together, transferring charge from one to the other. In engineering or household applications, current is often described as being either direct current (DC) or alternating current (AC). These terms refer to how the current varies in time. Direct current, as produced by example from a battery and required by most electronic devices, is a unidirectional flow from the positive part of a circuit to the negative. :11 If, as is most common, this flow is carried by electrons, they will be travelling in the opposite direction. Alternating current is any current that reverses direction repeatedly; almost always this takes the form of a sine wave. :206–207 Alternating current thus pulses back and forth within a conductor without the charge moving any net distance over time. The time-averaged value of an alternating current is zero, but it delivers energy in first one direction, and then the reverse. Alternating current is affected by electrical properties that are not observed under steady state direct current, such as inductance and capacitance. :223–225 These properties however can become important when circuitry is subjected to transients, such as when first energised. The concept of electric potential is closely linked to that of the electric field. A small charge placed within an electric field experiences a force, and to have brought that charge to that point against the force requires work. The electric potential at any point is defined as the energy required to bring a unit test charge from an infinite distance slowly to that point. It is usually measured in volts, and one volt is the potential for which one joule of work must be expended to bring a charge of one coulomb from infinity. :494–498 This definition of potential, while formal, has little practical application, and a more useful concept is that of electric potential difference, and is the energy required to move a unit charge between two specified points. An electric field has the special property that it is conservative, which means that the path taken by the test charge is irrelevant: all paths between two specified points expend the same energy, and thus a unique value for potential difference may be stated. :494–498 The volt is so strongly identified as the unit of choice for measurement and description of electric potential difference that the term voltage sees greater everyday usage. The effects of electromagnetism are most visibly employed in the electric motor, which provides a clean and efficient means of motive power. A stationary motor such as a winch is easily provided with a supply of power, but a motor that moves with its application, such as an electric vehicle, is obliged to either carry along a power source such as a battery, or to collect current from a sliding contact such as a pantograph. In the 19th and early 20th century, electricity was not part of the everyday life of many people, even in the industrialised Western world. The popular culture of the time accordingly often depicts it as a mysterious, quasi-magical force that can slay the living, revive the dead or otherwise bend the laws of nature. This attitude began with the 1771 experiments of Luigi Galvani in which the legs of dead frogs were shown to twitch on application of animal electricity. "Revitalization" or resuscitation of apparently dead or drowned persons was reported in the medical literature shortly after Galvani's work. These results were known to Mary Shelley when she authored Frankenstein (1819), although she does not name the method of revitalization of the monster. The revitalization of monsters with electricity later became a stock theme in horror films.